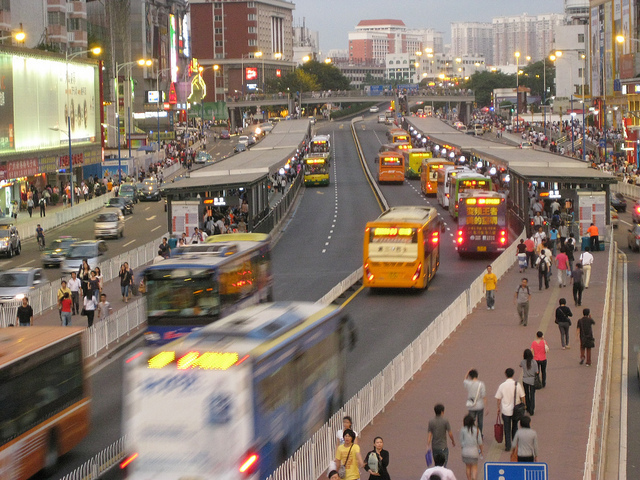 Guangzhou's BRT transformed the city's traffic by drawing commuters away from private vehicles and into mass transit. Photo by arkiben. On Tuesday, The Wall Street Journal ran an article on the growing popularity of bus rapid transit (BRT) around the world, and its possible success in the United States. The article described BRT as a modern transit system with the flexibility of buses, and the speed, comfort and reliability of rail. BRT, featuring dedicated lanes, accommodating service areas, technologically advanced stations and GPS tracking systems, offers a comprehensive mass transit service at a fraction of typical costs. In fact, the WSJ article cites that for the amount of capital it takes to build a single rail line, localities can build multiple BRT lines. Walter Hook, executive director at the Institute for Transportation and Development Policy (ITDP), confirms BRT’s potential in cities where funding is scarce. “BRT will be an important option for transit systems in the future, especially in cities where transit demand is high and budgets are tight,” Hook says. BRT has found success around the world thanks to its flexible service and low capital investments. The world’s most successful BRT—the “RIT” in Curitiba, Brazil—serves over 2 million passengers a day, transforming the city’s traffic. Similarly, the systems in Bogota and Teheran respectively serve 1.7 million and 1.4 million passengers daily by drawing commuters away from private vehicles and on to mass transit. Overall, last year saw the completion of 16 new BRT services, and now 49 new systems are also on the way. Dani Simons, director of marketing and communications at ITDP, proved BRT’s transformative quality for cities in a post back in April. “Today the Guangzhou BRT services over 800,000 riders daily and was built for about one-tenth the cost of the metro,” Simons explained. Furthermore, Simons adds that the Guangzhou BRT was able to eliminate 50,000 tons of carbon dioxide in its first year, mostly due in part to residents choosing BRT over private vehicles and taxis, in addition to help cut congestion and improve traffic flow. In addition to the global enthusiasm for BRT, the system has attracted attention gradually in the U.S., WSJ adds. There are currently five cities in the U.S., including Los Angeles and Cleveland, which use BRT as a part of their public transit system. ITDP reports that there are eight to ten new U.S. systems under consideration. BRT critics are still doubtful on whether the system will gain ground in the U.S. Anthony Perl, a professor of urban studies at Simon Fraser University in Vancouver doesn’t believe that BRT will be able to attract ridership as strongly as rail. “Rail has a proven record of being able to take people out of their cars; buses don’t,” Perl says. “I’m for taking road space and using it more efficiently, but not building roads. If we talk about building, I think you might as well build rail,” Perl concludes.